In this chapter we are going to get familiar with some of the basic presentations of data in programming: lists and linear data structures. Very often in order to solve a given problem we need to work with a sequence of elements. For example, to read completely this book we have to read sequentially each page, i.e. to traverse sequentially each of the elements of the set of the pages in the book. Depending on the task, we have to apply different operations on this set of data. In this chapter we will introduce the concept of abstract data types (ADT) and will explain how a certain ADT can have multiple different implementations. After that we shall explore how and when to use lists and their implementations (linked list, doubly-linked list and array-list). We are going to see how for a given task one structure may be more convenient than another. We are going to consider the structures "stack" and "queue", as well as their applications. We are going to get familiar with some implementations of these structures. Before we start considering classes in C#, which implement some of the most frequently, used data structures (such as lists and queues), we are going to consider the concepts of data structures and abstract data structures. Very often, when we write programs, we have to work with many objects (data). Sometimes we add and remove elements, other times we would like to order them or to process the data in another specific way. For this reason, different ways of storing data are developed, depending on the task. Most frequently these elements are ordered in some way (for example, object A is before object B). At this point we come to the aid of data structures – a set of data organized on the basis of logical and mathematical laws. Very often the choice of the right data structure makes the program much more efficient – we could save memory and execution time (and sometimes even the amount of code we write). In general, abstract data types (ADT) gives us a definition (abstraction) of the specific structure, i.e. defines the allowed operations and properties, without being interested in the specific implementation. This allows an abstract data type to have several different implementations and respectively different efficiency. In this chapter we are going to explore the linear (list-like) data structures, and in the next several chapters we are going to pay attention to more complicated data structures, such as trees, graphs, hash tables and sets, and we are going to explain how and when to use each of them. Mastering basic data structures in programming is essential, as without them we could not program efficiently. They, together with algorithms, are in the basis of programming and in the next several chapters we are going to get familiar with them. 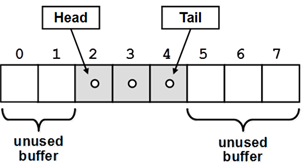 Most commonly used data structures are the linear (list) data structures. They are an abstraction of all kinds of rows, sequences, series and others from the real world. We could imagine the list as an ordered sequence (line) of elements. Let’s take as an example purchases from a shop. In the list we can read each of the elements (the purchases), as well as add new purchases in it. We can also remove (erase) purchases or shuffle them. List is a linear data structure, which contains a sequence of elements. The list has the property length (count of elements) and its elements are arranged consecutively. The list allows adding elements on different positions, removing them and incremental crawling. Like we already mentioned, an ADT can have several implementations. An example of such ADT is the interface System. Interfaces in C# construct a frame (contract) for their implementations – classes. This contract consists of a set of methods and properties, which each class must implement in order to implement the interface. The data type "Interface" in C# we are going to discuss in depth in the chapter "Object-Oriented Programming Principles". Each ADT defines some interface. Let’s consider the interface System. Let’s see several from the basic implementations of the ADT list and explain in which situations they should be used. Arrays perform many of the features of the ADT list, but there is a significant difference – the lists allow adding new elements, while arrays have fixed size. We implemented the operation adding a new element, as well as inserting a new element which both first ensure that the internal array (buffer) holding the elements has enough capacity. If the internal buffer is full, it is extended (grown) to a double of the current capacity. Since arrays in .NET do not support resizing, the growing operation allocated a new array of double size and moves all elements from the old array to the new. /// element in this list (or -1 if it does not exist). In the methods above we remove elements. For this purpose, firstly we find the searched element, remove it and then shift the elements after it by one position to the left, in order to fill the empty position. Finally, we fill the position after the last item in the array with null value (the default(T)) to allow the garbage collector to release it if it is not needed. Generally, we want to keep all unused elements in the arr empty (null / zero value). As we saw, the static list has a serious disadvantage – the operations for inserting and removing items from the inside of the array requires rearrange­ment of the elements. When frequently inserting and removing items (especially a large number of items), this can lead to low performance. In such cases it is advisable to use the so called linked lists. The difference in them is the structure of elements – while in the static list the element contains only the specific object, with the dynamic list the elements keep information about their next element. First, let’s consider the recursive class ListNode. It holds a single element and a reference (pointer) to the next element which is of the same class ListNode. So ListNode is an example of recursive data structure that is defined by referencing itself. The class is inner to the class DynamicList<T> (it is declared as a private member) and is therefore accessible only to it. For our DynamicList<T> we create 3 fields: head – pointer to the first element, tail – pointer to the last element and count – counter of the elements. Upon the initial construction the list is empty and for this reason we assign head = tail = null and count = 0. We are going to implement all basic operations: adding and removing items, as well as searching for an element and accessing the elements by index. - The list remains empty after the removal à we remove the whole list along with its head and tail (head = null, tail = null, count = 0). - The element for removal is at the start of the list (there is no previous element) à we make head to point at the element immediately after the removed element (or at null, if the removed element was the last one). - The element is in the middle or at the end of the list à we direct the element before it to point to the element after it (or at null, if there is no next element). Finally, we make sure tail points to the end of the list (in case tail was pointed to the removed element, it is fixed to point to its predecessor). /// Removes the specified item and return its index. The removal by value of an element works like the removal of an element by index, but there are two special considerations: the searched element may not exist and for this reason an extra check is necessary; there may be elements with null value in the list, which have to be removed and processed correctly. The last is done by comparing the elements through the static method object.Equals(…) which works well with null values. In order the removal to work correctly, it is necessary the elements in the array to be comparable, i.e. to have a correct implementation of the method Equals() derived from System.Object. The searching for an element works like in the method for removing: we start from the beginning of the list and check sequentially the next elements one after another, until we reach the end of the list or find the searched element. The indexer works pretty straightforward – first checks the validity of the specified index and then starts from the head of the list goes to the next node index times. Once the node containing the element the specified index is found, it is accessed directly. The above example demonstrates that certain ADT could be implemented in several conceptually different ways and the users may not notice the difference between them. Still, different implementations could have different performance and could take different amount of memory. This concept, known as abstract behavior, is fundamental for OOP and can be implemented by abstract classes or interfaces as we shall see in the section "Abstraction" of chapter "Object-Oriented Programming Principles". As we saw, one of the main problems with this implementation is the resizing of the inner array when adding and removing elements. In the ArrayList the problem is solved by preliminarily created array (buffer), which gives us the opportunity to add elements without resizing the array at each insertion or removal of elements. Note that in the array list we hold different types of values (int, float, uint and string) and we sum them in a variable of special type called dynamic. In C# dynamic is a universal data type intended to hold any value (numbers, objects, strings, even functions and methods). Operations over dynamic variables (like the + operator used above) are resolved at runtime and their action depends on the actuals values of their arguments. At compile time almost every operation with dynamic variables successfully compiles. At runtime, if the operation can be performed, it is performed, otherwise and exception is thrown. This explains why we apply the operation + over the arguments 2, 3.5f, 25u and " EUR" and we finally obtain as a result the string "30.5 EUR". Before we continue to play with more examples of working with the ArrayList class, we shall recall the concept of Generic Data Types in C#, which gives the opportunity to parameterize lists and collections in C#. When we use the ArrayList class and all classes, which implement the interface System.IList, we face the problem we saw earlier: when we add a new element from a class, we pass it as a value of type object. Later, when we search for a certain element, we get it as object and we have to cast it to the expected type (or use dynamic). It is not guaranteed, however, that all elements in the list will be of one and the same type. Besides this, the conversion from one type to another takes time, and this drastically slows down the program execution. Let’s consider some of the generic collections in .NET Framework. List<T> is the generic variant of ArrayList. When we create an object of type List<T>, we indicate the type of the elements, which will be hold in the list, i.e. we substitute the denoted by T type with some real data type (for example number or string). Thus the created list can contain only integer numbers and cannot contain other objects, for example strings. If we try to add to List<int> an object of type string, we are going to get a compilation error. Via the generic types the C# compiler protects us from mistakes when working with collections. Thanks to the preliminarily allocated capacity of the array, containing the elements of the class List<T>, it can be extremely efficient data structure when it is necessary to add elements fast, extract elements and access the elements by index. Still, it is pretty slow in inserting and removing elements unless these elements are at the last position. We could say that List<T> combines the good sides of lists and arrays – fast adding, changeable size and direct access by index. - The search by index is very fast – we can access with equal speed each of the elements, regardless of the count of elements. - The search for an element by value works with as many comparisons as the count of elements (in the worst case), i.e. it is slow. - Inserting and removing elements is a slow operation – when we add or remove elements, especially if they are not in the end of the array, we have to shift the rest of the elements and this is a slow operation. - When adding a new element, sometimes we have to increase the capacity of the array, which is a slow operation, but it happens seldom and the average speed of insertion to List does not depend on the count of elements, i.e. it works very fast. Use List<T> when you don’t expect frequent insertion and deletion of elements, but you expect to add new elements at the end of the list or to access the elements by index. Let’s consider a more interesting example – let’s write a program, which can find the union and the intersection of two sets of numbers. We could consider that there are two lists of numbers and we would like to take the elements, which are in both sets (intersection), or we look for those elements, which are at least in one of the sets (union). The program logic in this solution directly follows the definitions of union and intersection of sets. We use the operations for searching for an element in a list and insertion of a new element in a list. In order to intersect the sets we do the following: we put all elements from the first list (via AddRange()), after which we remove all elements, which are not in the second list. The problem can also be solved even in an easier way by using the method RemoveAll(Predicate<T> match), but it is related to using programming constructs, called delegates and lambda expressions, which are considered in the chapter Lambda Expressions and LINQ. The union we make as we add elements from the first list, after which we remove all elements, which are in the second list, and finally we add all elements of the second list. This class is a dynamic implementation of a doubly linked list built in .NET Framework. Its elements contain a certain value and a pointer to the previous and the next element. The LinkedList<T> class in .NET works in similar fashion like our class DynamicList<T>. When Should We Use LinkedList<T>? - The append operation is very fast, because the list always knows its last element (tail). - Inserting a new element at a random position in the list is very fast (unlike List<T>) if we have a pointer to this position, e.g. if we insert at the list start or at the list end. - Searching for elements by index or by value in LinkedList is a slow operation, as we have to scan all elements consecutively by beginning from the start of the list. - Removing elements is a slow operation, because it includes searching. LinkedList<T> has the same operations as in List<T>, which makes the two classes interchangeable, but in fact List<T> is used more often. Later we are going to see that LinkedList<T> is used when working with queues. Using LinkedList<T> is preferable when we have to add / remove elements at both ends of the list and when the access to the elements is consequential. However, when we have to access the elements by index, then List<T> is a more appropriate choice. Considering memory, LinkedList<T> generally takes more space because it holds the value and several additional pointers for each element. List<T> also takes additional space because it allocates memory for more elements than it actually uses (it keeps bigger capacity than the number of its elements). Let’s imagine several cubes, which we have put one above other. We could put a new cube on the top, as well as remove the highest cube. Or let’s imagine a chest. In order to take out the clothes on the bottom, first we have to take out the clothes above them. This is the classical data structure stack – we could add elements on the top and remove the element, which has been added last, but no the previous ones (the ones that are below it). In programming the stack is a commonly used data structure. The stack is used internally by the .NET virtual machine (CLR) for keeping the variables of the program and the parameters of the called methods (it is called program execution stack). The Abstract Data Type "Stack"
The stack is a data structure, which implements the behavior "last in – first out" (LIFO). As we saw with the cubes, the elements could be added and removed only on the top of the stack. ADT stack provides 3 major operations: push (add an element at the top of the stack), pop (take the last added element from the top of the stack) and peek (get the element form the top of the stack without removing it). The data structure stack can also have different implementations, but we are going to consider two – dynamic and static implementation. Like with the static list we can use an array to keep the elements of the stack. We can keep an index or a pointer to the element, which is at the top. Usually, if the internal array is filled, we have to resize it (to allocate twice more memory), like this happens with the static list (ArrayList, List<T> and CustomArrayList<T>). 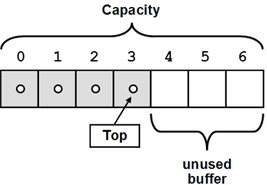 Unused buffer memory should be hold to ensure fast push and pop operations. When the stack is empty, the top has value null. When a new item is added, it is inserted on a position where the top indicates, after which the top is redirected to the new element. Removal is done by deleting the first element, pointed by the top pointer. In C# we could use the standard implementation of the class in .NET Framework System.Collections.Generics.Stack<T>. It is implemented statically with an array, as the array is resized when needed. Let’s take a look at a simple example on how to use stack. We are going to add several elements, after which we are going to print them on the console. The "queue" data structure is created to model queues, for example a queue of waiting for printing documents, waiting processes to access a common resource, and others. Such queues are very convenient and are naturally modeled via the structure "queue". In queues we can add elements only on the back and retrieve elements only at the front. For instance, we would like to buy a ticket for a concert. If we go earlier, we are going to buy earlier a ticket. If we are late, we will have to go at the end of the queue and wait for everyone who has come earlier. This behavior is analogical for the objects in ADT queue. The abstract data structure "queue" satisfies the behavior "first in – first out" (FIFO). Elements added to the queue are appended at the end of the queue, and when elements are extracted, they are taken from the beginning of the queue (in the order they were added). Thus the queue behaves like a list with two ends (head and tail), just like the queues for tickets. Like with the lists, the ADT queue could be implemented statically (as resizable array) and dynamically (as pointer-based linked list). Static queue keeps an internal buffer with bigger capacity than the actual number of elements in the queue. Like in the static list implementation, when the space allocated for the queue elements is finished, the internal buffer grows (usually doubles its size). The major operations in the queue ADT are enqueue (append at the end of the queue) and dequeue (retrieve an element from the start of the queue). However, here elements are added at the end of the queue (tail), and are retrieved from its beginning (head), while we have no permission to get or add elements at any another position. In C# we use the static implementation of queue via the Queue<T> class. Here we could indicate the type of the elements we are going to work with, as the queue and the linked list are generic types. You can see that the elements leave the queue in the order, in which they have entered the queue. This is because the queue is FIFO structure (first-in, first out). As you can see, stack and queue are two specific data structures with strictly defined rules for the order of the elements in them. We used queue when we expected to get the elements in the order we inserted them, while we used stack when we needed the elements in reverse order. 1. Write a program that reads from the console a sequence of positive integer numbers. The sequence ends when empty line is entered. Calculate and print the sum and the average of the sequence. Keep the sequence in List<int>. 2. Write a program, which reads from the console N integers and prints them in reversed order. Use the Stack<int> class. 3. Write a program that reads from the console a sequence of positive integer numbers. The sequence ends when an empty line is entered. Print the sequence sorted in ascending order. 4. Write a method that finds the longest subsequence of equal numbers in a given List<int> and returns the result as new List<int>. Write a program to test whether the method works correctly. 5. Write a program, which removes all negative numbers from a sequence. 6. Write a program that removes from a given sequence all numbers that appear an odd count of times. 7. Write a program that finds in a given array of integers (in the range [0…1000]) how many times each of them occurs. 8. The majorant of an array of size N is a value that occurs in it at least N/2 + 1 times. Write a program that finds the majorant of given array and prints it. If it does not exist, print "The majorant does not exist!". Using the Queue<T> class, write a program which by given N prints on the console the first 50 elements of the sequence. Write a program, which finds the shortest subsequence from the operations, which starts with N and ends with M. Use queue. 11. Implement the data structure dynamic doubly linked list (DoublyLinkedList<T>) – list, the elements of which have pointers both to the next and the previous elements. Implement the operations for adding, removing and searching for an element, as well as inserting an element at a given index, retrieving an element by a given index and a method, which returns an array with the elements of the list. 12. Create a DynamicStack<T> class to implement dynamically a stack (like a linked list, where each element knows its previous element and the stack knows its last element). Add methods for all commonly used operations like Push(), Pop(), Peek(), Clear() and Count. 13. Implement the data structure "Deque". This is a specific list-like structure, similar to stack and queue, allowing to add elements at the beginning and at the end of the structure. Implement the operations for adding and removing elements, as well as clearing the deque. If an operation is invalid, throw an appropriate exception. 14. Implement the structure "Circular Queue" with array, which doubles its capacity when its capacity is full. Implement the necessary methods for adding, removing the element in succession and retrieving without removing the element in succession. If an operation is invalid, throw an appropriate exception. 15. Implement numbers sorting in a dynamic linked list without using an additional array or other data structure. 16. Using queue, implement a complete traversal of all directories on your hard disk and print them on the console. Implement the algorithm Breadth-First-Search (BFS) – you may find some articles in the internet. 17. Using queue, implement a complete traversal of all directories on your hard disk and print them on the console. Implement the algorithm Depth-First-Search (DFS) – you may find some articles in the internet. 18. We are given a labyrinth of size N x N. Some of the cells of the labyrinth are empty (0), and others are filled (x). We can move from an empty cell to another empty cell, if the cells are separated by a single wall. We are given a start position (*). Calculate and fill the labyrinth as follows: in each empty cell put the minimal distance from the start position to this cell. If some cell cannot be reached, fill it with "u". 1. See the section "List<T>". 3. Keep the numbers in List<T> and finally use its Sort() method. 4. Use List<int>. Scan the list with a for-loop (1 … n-1) while keeping two variables: start and length. Initially start=0, length=1. At each loop iteration if the number at the left is the same as the current number, increase length. Otherwise restart from the current cell (start=current, length=1). Remember the current start and length every time when the current length becomes better than the current maximal length. Finally create a new list and copy the found sequence to it. 5. Use list. Perform a left-to-right scan through all elements. If the current number is positive, add it to the result, otherwise, skip it. 6. Slow solution: pass through the elements with a for-loop. For each element p count how many times p appears in the list (with a nested for-loop). If it is even number of times, append p to the result list (which is initially empty). Finally print the result list. * Fast solution: use a hash-table (Dictionary<int, int>). With a single scan calculate count[p] (the number of occurrences of p in the input sequence) for each number p from the input sequence. With another single scan pass though all numbers p and append p to the result only when count[p] is even. Read about hash tables from the chapter “Dictionaries, Hash-Tables and Sets”. 7. Make a new array "occurrences" with size 1001. After that scan through the list and for each number p increment the corresponding value of its occurrences (occurrences[p]++). Thus, at each index, where the value is not 0, we have an occurring number, so we print it. 8. Use list. Sort the list and you are going to get the equal numbers next to one another. Scan the array by counting the number of occurrences of each number. If up to a certain moment a number has occurred N/2+1 times, this is the majorant and there is no need to check further. If after position N/2+1 there is a new number (a majorant is not found until this moment), there is no need to search further – even in the case when the list is filled with the current number to the end, it will not occur N/2+1 times. Another solution: Use a stack. Scan through the elements. At each step if the element at the top of the stack is different from the next element form the input sequence, remove the element from the stack. Otherwise append the element to the stack. Finally the majorant will be in stack (if it exists). Why? Each time when we find any two different elements, we discard both of them. And this operation keeps the majorant the same and decreases the length of the sequence, right? If we repeat this as much times as possible, finally the stack will hold only elements with the same value – the majorant. 9. Use queue. In the beginning add N to the queue. After that take the current element M and add to the queue M+1, then 2*M + 1 and then M+2. Repeat the same for the next element in a loop. At each step in the loop print M and if at certain point the queue size reaches 50, break the loop and finish the calculation. 10. Use the data structure queue. Firstly, add to the queue N. Repeat the following in a loop until M is reached: remove a number X from the queue and add 3 new elements: X * 2, X + 2 and X + 1. Do not add numbers greater than M. As optimization of the solution, try to avoid repeating numbers in the queue. 11. Implement DoubleLinkedListNode<T> class, which has fields Previous, Next and Value. It will hold to hold a single list node. Implement also DoubleLinkedList<T> class to hold the whole list. 12. Use singly linked list (similar to the list from the previous task, but only with a field Previous, without a field Next). 13. Just modify your implementation of doubly-linked list to enable adding and removing from both its head and tail. Another solution is to use circular buffer (see http://en.wikipedia.org/wiki/Circular_buffer). When the buffer is full, create a new buffer of double size and move all existing elements to it. 14. Use array. When you reach the last index, you need to add the next element at the beginning of the array. For the correct calculation of the indices use the remainder from the division with the array length. When you need to resize the array, implement it the same way like we implemented the resizing in the "Static List" section. 15. Use the simple Bubble sort. We start with the leftmost element by checking whether it is smaller than the next one. If it is not, we swap their places. Then we compare with the next element and so on and so forth, until we reach a larger element or the end of the array. We return to the start of the array and repeat the same procedure many times until we reach a moment, when we have taken sequentially all elements and no one had to be moved. 16. The algorithm is very easy: we start with an empty queue, in which we put the root directory (from which we start traversing). After that, until the queue is empty, we remove the current directory from the queue, print it on the console and add all its subdirectories to the queue. This way we are going to traverse the entire file system in breadth. If there are no cycles in the file system (as in Windows), the process will be finite. 17. If in the solution of the previous problem we substitute the queue with a stack, we are going to get traversal in depth (DFS). 18. Use Breath-First Search (BFS) by starting from the position, marked with "*". Each unvisited adjacent to the current cell we fill with the current number + 1. We assume that the value at "*" is 0. After the queue is empty, we traverse the whole matrix and if in some of the cells we have 0, we fill it with "u". Download the demo examples for this chapter from the book: Linear-Data-Structures-Demos.zip. Thanks for the material, it’s helpful for review DS. I’m also using the Mind Mapping technique, however, you version of mind map is written in you native language, is there any way you can provide an English version? or a link where I can get it? here, however I assumed this post was once good. I do not recognise who you’re however certainly you’re going to a famous blogger when you aren’t already. You really understand to concept. I have found this to be one of the best explanations so far. Τhis paragraph ԝill help the internet visitors fօr creating new blog оr even a blog from start tօ end. Estou feliz com a iniciativa de vocês, o conhecimento não tem fronteiras.